And now, the final annual look back (with an excuse to pick the Bowl game winners) at the 2018 uniforms and combinations of all the teams involved in the final set of College Football Bowl Games, covering your matchups for today and tomorrow. If you missed Part I, you can click here, and for Part II, click here. The concept of this exercise is pretty simple: pick the winners of the bowl games (against the spread), based on who has the better uniform set worn throughout the 2018 season. I usually get about 50% correct this way (which is to say, about the same odds as if I’d flipped a coin). As previously mentioned I’ll be breaking them up into segments: two weekends ago (see link above) — the 11 bowls that took place the first week. Last weekend saw matchups for the 13 games played this past week (link above), and finally today is the last 16 bowls (excluding the final-final National Championship Game to be played on Monday, January 7th) with teams you’ve actually watched all season long. You can click on any image to enlarge. After going “crazy” with four combos last year, Michigan returned to just two: and they’re both classic (though some would prefer UM to go with maize pants on the road). Florida also looked pretty great this season, even wearing a script “Gators” on their white hats. One of my favorite things about them used to be their “stealth” striping pattern, which was always orange/blue/white/blue/orange, no matter what jersey or pants, but they scrapped that on the orange kits a few years back. This will be a good looking game regardless, but I thing maize & blue gets a slight nod over orange & blue. The Pick: I’ll take TSUN and give the points. After going with only two combos (a pleasant surprise) last season, this year Virginia debuted new unis and showed off a few variations — and their navy and orange is a pleasing combo to say the least. USC (the only one in the show this year) looked equally resplendent in their garnet and black; they’ve really improved over the years since moving to UA. This one is really a tough call, but I think I have to lean to SCar. Barely. Gah. I have a feeling this one won’t be so easy on the eyes, though depending on the combos worn, it might be passable. Picking a “favorite” is tough here: Ark State is their scarlet & black have atrocious fonts, truncated pants stripes on their white & red set, and TNDL on their black set. Woof. Nevada is about as plain (normally a good thing) and boring (never a good thing) as can be. In theory, their colors are blue and silver, but that stuff looks gray to me. But then, I don’t hate gray as a color as long as it’s official. That gives the Pack the nod. Barely. I never used to like Clemson’s unis, but they’ve gotten better over the past several years, with Nike giving them normal stripes. They also stick to a “pattern” in that they wear the all-purple for one game a year, in the later half of the season, and then wear orange britches for their final games. Damn that looks good. I don’t hate Notre Dame’s uniforms, but this year they actually went off the board three times: the “throwback” (including the retro helmet), a green jersey (a nice choice, except it’s a terrible shade, IMO) and then … well, that awful Shamrock Series Yankee-lookalike getup they wore against Syracuse. Yecch. The Tigers would have probably gotten my pick either way, but that pinstriped pants number sealed the deal. Score the first playoff game to the orange & purple. The Pick: Clemson, even giving up a ton. OK. No contest here. You know (and if you don’t you should by now) that Alabama is my favorite uni-attired team in all of football, so they’d be my pick regardless of opponent. But this is an easy one vs. Oklahoma. I’ll give the Sooners this: their switch from Nike to Jordan Brand made their alternate “Bring The Wood” unis much better, as they went from truly awful toilet seat collars and truncated pants stripes to something much more visually appealing. Still not enough, but better. Playoff number two locked and loaded. If only Pitt wore their wonderful royal and athletic gold throwbacks for the full season, this would be an easy, easy call. But, alas, the stuck with the navy & metallic for most of the season. Stanford — resplendent in white and cardinal — still love to throw in the BFBS outfit at least once a year. The Cardinal also made an ever-so-slight change this season, adding a black outline to their numbers when in years past they were sans-outline. I’m not sure that was a change for the better. Here’s hoping the Panthers wear throwbacks to make this a glorious game (one that even Jimmer Vilk might watch). It would be an easy call but for Pitt’s crappy regular unis. When’s the last time you saw Oregon with less uniform iterations in a season than their opponent? Never? Well, when Oregon went to their new unis, with GIANT numbers, the plan was (I guess) for them to play in monochrome all year, and to repeat several combos. Shocking! Sparty, on the other hand, stuck entirely with green and white combos this year (in prior years they’d done some “pro combat” and bronze mixing). Those colors always look great, although I wish they’d rid themselves of the awful white set with weird striping. The plain white are just fine. As much as I love me some Ducks, they didn’t have an overall better look than Sparty, but it was a lot closer this year than in years past, for sure. I am not a fan of Mizzou’s unis, but I have to say, I really did like their all gold look (a new uni set for 2018). But that’s about it. They’re not the worst black/gold attired team out there, but they’re far from the best. Okie State, on the other hand, always looks, in the words of Jason Bernard, “predictably gorgeous.” Even the GFGS pieces of the ensemble seem to work. Honestly, orange and black is a great pair of colors, and OSU milks all possible combos to perfection. In what goes against my GFGS and multiple outfit mantra, this is one team who can pull it off, and pull it off well! Cowboy over Tiger here. I think I’ll take a holiday from watching this one. In a “lesser of two evils” scenario, you have both teams wearing many, many different uni sets, but at least Utah sticks to school colors. NU not only goes BFBS but GFGS; it’s tough to wear 13 different combos when you only have two official colors. I like the Utes colors (but hate the pants striping), and those red satin hats are purdy. There’s nothing good about NU. Sorry. At last, a slam dunk! Except for the beveling on the fonts, I absolutely love aTm’s unis, and I love even more the fact that they kept it so simple (two pairs of pants, one helmet, two jerseys) this year. That’d be a tough uni set for anyone to top, but the Wolfpack make it so easy. NC State was one of several teams to get new unis this year, and there’s pretty much nothing to like about them: bad fonts, weird shoulder “striping” (what the hell is that, anyway?) and not one, not two, but THREE sets of white pants, plus two white jerseys. Yeah, um no. This one’s easy. Miss State looks a lot like aTm, and if they kept it to two combos all year, I’d like them even more. They have a great template, and I really dig the gray pants. Not quite sure what to make of their “Mississippi Statesman” uniform, but I won’t hold it against them. It wouldn’t matter anyway, though, because Iowa’s unis are far superior (superior, even, to their NFL cousins, the Steelers — insofar as the Hawkeyes have real block fonts and stripes that fit on their shoulder caps — unlike their NFL bretheren). This should be a good looking game, for sure, as we kick off the 2019 year. After Alabama, PSU are probably my second favorite uni-attired team in the NCAA, so this game is basically no contest. And even if it were, Kentucky would lose to most other schools anyway. I do love the checkerboard pattern, and if they kept it to just white and blue unis, I’d love it even more. But they wear a shiny silver hat and BFBS, and that’s two strikes against them. When going up against the Nits, it’s not even close. When will UCF get respect? They haven’t lost a game in two years, and yet, they’re in the Fiesta Bowl against a three-loss LSU team as more than a touchdown dog. Maybe this game will remedy some of that. Unfortunately, it won’t in the uni department. UCF is still second tier when it comes to their unis — and none of their sets (save for maybe the Citronaut unis) looks any good. At least they don’t look like Rutgers anymore. Now, the Bayou Bengals…they almost always look great and their only “special” uni this year kinda fell a bit flat (the helmet was supposed to color shift in certain lighting conditions), but still, not a terrible third outfit. UCF may have my football respect, but they don’t earn my uni respect…yet. The Granddaddy will be a pretty good looking game as both teams keep it simple uni-wise. THE had to go BFBS, of course, and Washington wore an attractive all white number with shiny purple hats. But Washington’s unis overall are just not good. They have the ridiculous armpit inserts and black sleeve caps on the purple jersey. They’d been keeping it simple for the past few years, but maybe their next uniform set will be even better. Until then, OSU will get the nod. Our last bowl of the season is probably the best overall uni matchup of them all (at least if you like the classics), and this one will be a tough, tough call. Uga always looks sharp with their red hats and silver britches, and Texas — well, to me, they have the best all white (road) uniform in the game. Texas got slightly updated unis this year when they slightly enlarged the “TEXAS” across the chest. Otherwise, they look as great as always. Burnt orange never looked so good. The Pick: Gimme Texas and all those points. And there you have it — the final 16 bowls of the 2018 season. Let’s see if I can do better than my usual 50% in picking winners based on the better uni combos worn throughout the season. At 43 years old, Cy Young was in his last full year in the big leagues, straddled by a large belly that impeded his movement off the mound. When Walter Johnson was the same age, he had been retired from pitching for four years. Bob Feller, with his last good season at the age of 35, quit a month after turning 38. Sandy Koufax and his arthritic elbow both pitched their last game at the age of 30. Admittedly, the lifespan of an effective power pitcher is not a long one. Unless your name is Lynn Nolan Ryan. On June 11, 1990, he proved just that. 33,436 fans filed into the Oakland Coliseum on a mild evening to witness history, as the aging fireballer tossed the sixth no-hit, no-run ballgame of his storied career. Perhaps it came as a surprise to most. At that point, Ryan’s 24th year in the majors had not been the kindest to him. He had just recently gotten off of a stay on disabled list due to a sore back that had been hampered him since an early May start. Upon his return – coincidentally also against the Athletics – he gave up five runs in just as many innings in a 5-4 loss. In his previous six starts, he had gone 0-3 with an 8.86 earned run average. In fact, he had not won since April 26. Also, on the other side of the battery was John Russell, who had never caught Ryan before. Veterans Geno Petralli and Mike Stanley were both injured, so the assignment was handed to Russell, who had been given a Triple A contract by Texas in May. In fact, only six weeks prior to that June night, he had been helping coach a high school team in suburban Philadelphia. Add to that the fact that the Rangers were facing Oakland again, who were in first place and seemed well on their way to a third straight World Series appearance, it seemed like the ingredients were very much an unlikely combination for a stellar effort. However, the opposing Athletics failed to come even close to getting a strong, clean hit. They only twice provided anything that could even remotely be considered a big scare to the defense, with Willie Randolph flying out to the warning track in left to open the fourth inning, and then Rickey Henderson’s liner to center with one on in the sixth. Ryan’s first two strikeouts of the night came in the opening inning alone, with him wracking up another twelve by the game’s conclusion. Each of the fourteen was of the swinging variety, showcasing how great the combination of his fastball and changeup was. The latter carried him early on, as his stiff back was preventing him from hitting 90 mph on his heaters. Though flinching and grimacing with pain throughout the entire contest, he managed to strike out the side in the fifth on 11 pitches, and according to the Athletics, eventually reached the mid-90s on his fastball in the final three innings. Offensively for Texas, Julio Franco came through with a pair of two-run homers, and even John Russell contributed with a solo blast of his own, but Ryan was the star. He started the ninth by striking out pinch-hitter Ken Phelps. A check-swing by Rickey Henderson led to a slow roller and a strong, off-balance throw by Jeff Huson to get the speedster at first. And finally, on a 2-0 pitch, Willie Randolph flew out to shallow right in foul territory. Ruben Sierra made the catch at 9:56 to end the game and begin the celebration. Ryan jubilantly pumped his right arm into the air as he was mobbed by his teammates, who would carry him off the field. Partisanship be damned, the Oakland crowd was with the Texan starting in the seventh inning or so, even chanting “Nolan!” over the course of the ninth. They showered him with a well-deserved standing ovation and raucous cheering when the final out was recorded. In the clubhouse, Ryan told reporters that the accomplishment was a special one because it came so late in his career, and that it really meant something to have the team so emotionally involved. Even Oakland manager Tony La Russa said, “You had a feeling early this would be something special. That idea could not have been further from what Nolan was thinking. Before the game he had claimed that his back felt ‘about the same,’ which in other words, was still hurting. Sure, he was rolling his hips and twisting his trunk between pitches to provide some relief, and strolled to the back of the mound to give his body more time to recover. And the next morning, he was to have his back examined in Los Angeles. But on that Monday night, Nolan was untouchable. …Lee Roy Selmon in gouache. It’s called gouache painting. Basically addition by subtraction – erasing paint. … gouache is not an easy thing to perfect. If you’re interested in a more in-depth description of gouache, click here. Anyway, Gene is back with a beautiful new artwork, this time the great Lee Roy Selmon, who he captured in the Tampa Bay Buccaneers mono-white “creamsicle” style uniforms. You can click on all of the pics below to enlarge. Thanks again, Gene (and keep ’em coming)! NFL News: Justin Berger noticed the Roku Store did some editing to a photo of Ahmad Bradshaw to inexplicably turn him into a Cowboy. 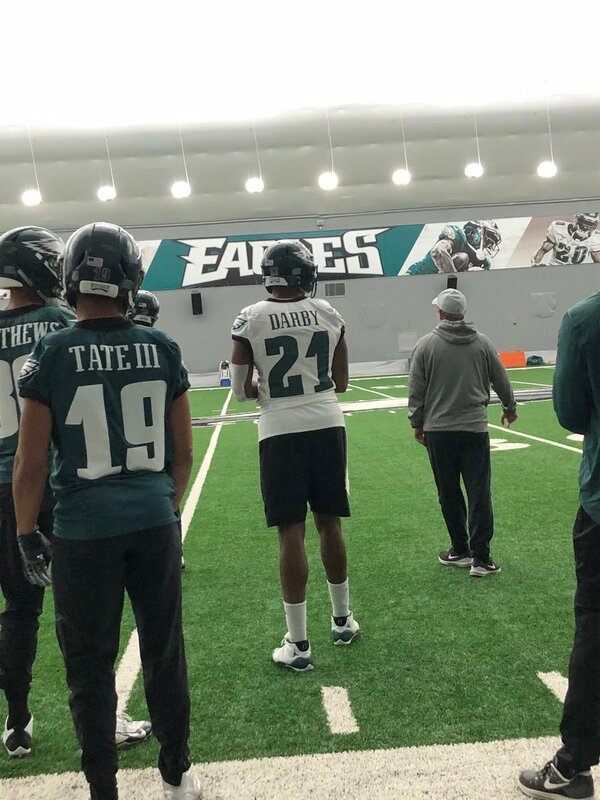 … Eagles WR Alshon Jeffrey wore injured CB Ronald Darby’s jersey during practice yesterday (from Sam McKinley). … A Twitter user noticed that the lettering on a weight belt in the Jags’ weightroom is the same as their own custom typeface (from Kristopher Terrell). 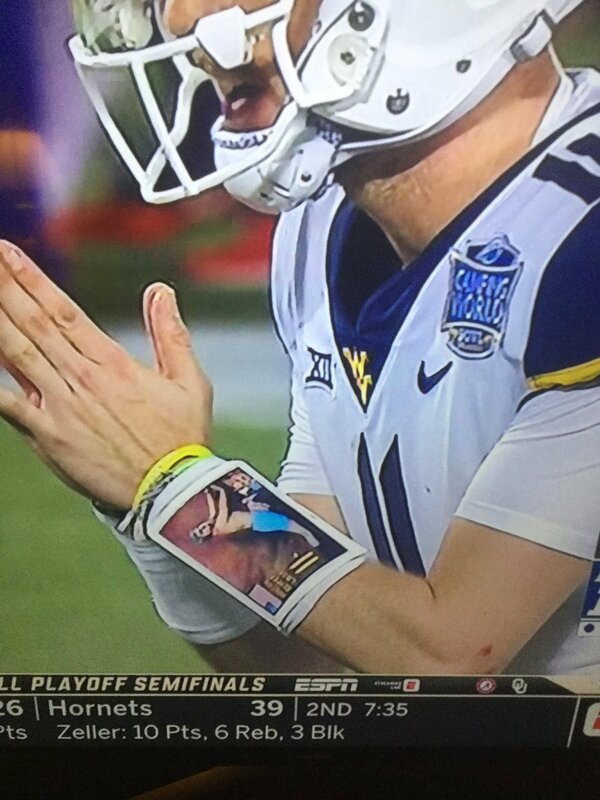 College/High School Football News: As a diehard Seinfeld fan, I was loving Jack Allison’s wristband during last night’s Camping World Bowl (thanks to Jeremy Reeder, @rtatford, James Gardner and everyone else who sent this in). … Notre Dame will have NOBs for the Cotton Bowl against Clemson (from @wr12066). … Virginia Tech will go maroon-maroon-white with matte helmets for the Military Bowl (from Andrew Cosentino). 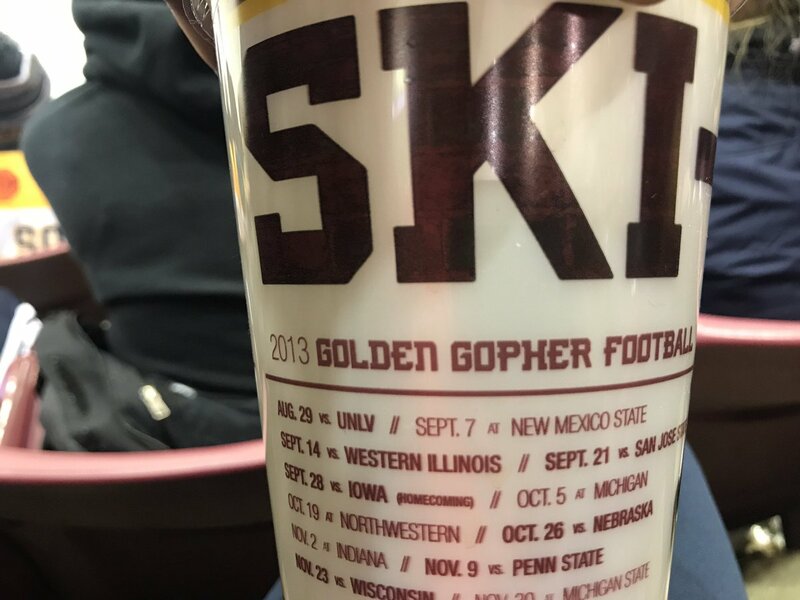 … Also posted in the hockey section: Minnesota was giving fans 2013 football cups during last night’s (hockey) game against Ferris State. At least they’re recycling! (from @rivermen123). Hockey News: Cross-posted from the NCAAF section: Minnesota was giving fans 2013 football cups during last night’s (hockey) game against Ferris State. At least they’re recycling! (from @rivermen123). 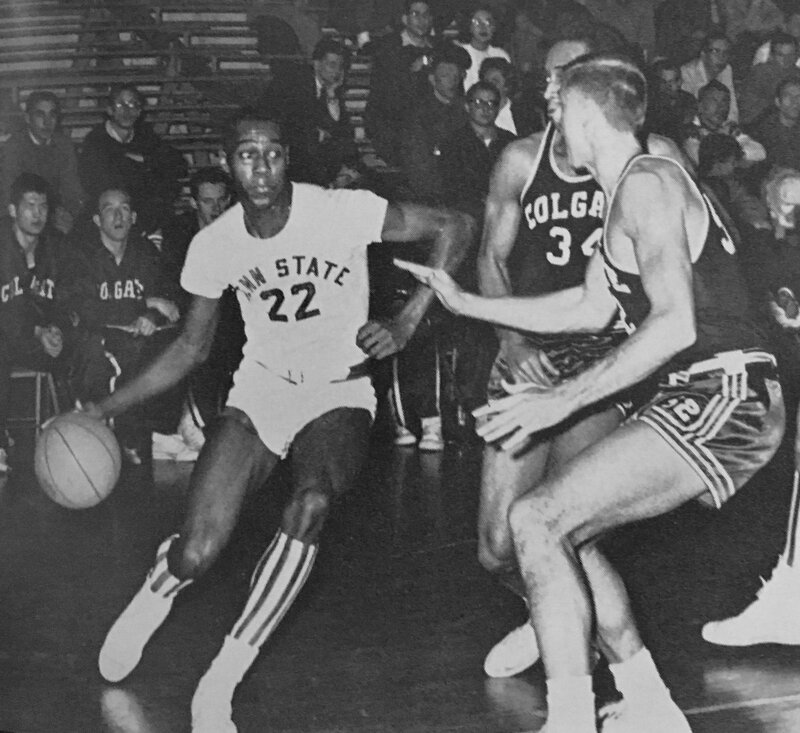 College and High School Hoops News: A lot going on in this shot of Penn State captain Gene Harris from December 1961, but the two big things are 1) the freaking awesome socks and 2) the sleeved jerseys for Penn State (many thanks to Mark Impomeni for sending this our way). … Franklin (Tn.) High went with some gorgeous throwbacks last night (from Chris Howell). … A lot going on in this photo from Josh Claywell. 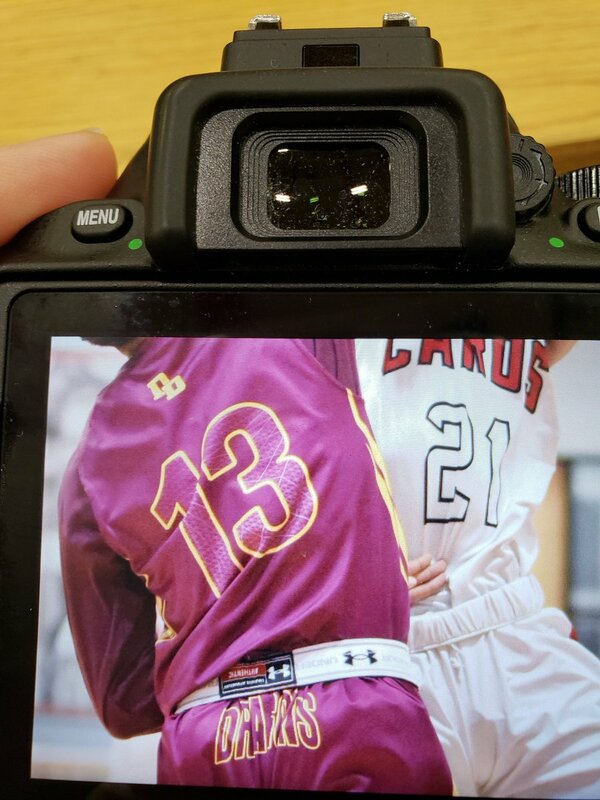 Taylor County (Ky.) High has white jerseys with white numbers, and Louisville Doss (Ky.) High has a tramp-stamp logo on the shorts and a scale-like pattern in the uni numbers, which makes sense, as their nickname is the Dragons. … Evidently there is a Loyola player with the surname “Fives” who wears, you guessed it, No. 5 (from James Gilbert). 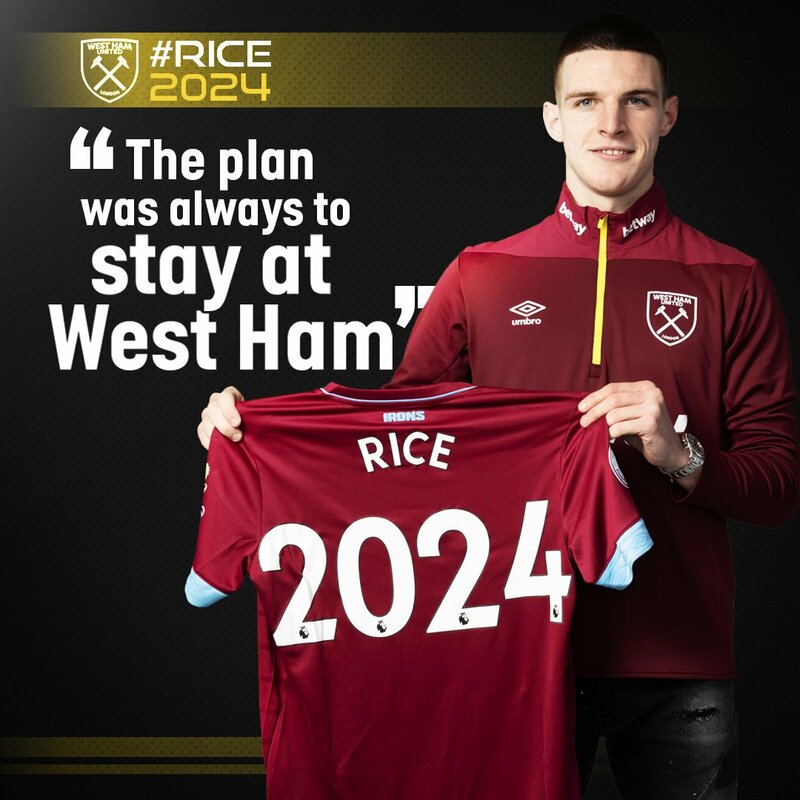 Soccer News: West Ham announced a new contract for CB Declan Rice with a special kit with the year “2024” as the number (from @alwayscromulent). … Eintracht Frankfurt fans voted for this gold kit to be Die Adler‘s 2019-20 third kit. … Here’s a look at what Premier League sides will be wearing over the weekend (from Josh Hinton). … BT Sport has come out with the latest installment of ‘What I Wore’, featuring Spurs midfielder Dele Alli. Grab Bag: In the latest installment of Quirky Nickname Watch, Pendleton (Or.) 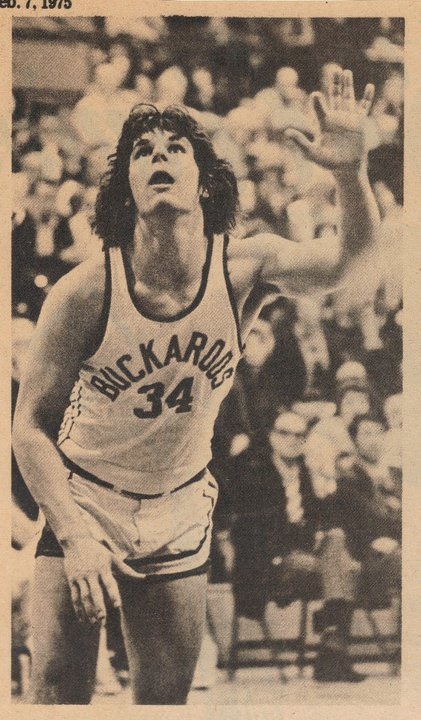 High’s nickname is the Buckaroos, though they seem to go mostly by “Bucks” now (from Brad Eenhuis). The ND throwbacks were from 2017, not this year. You are correct, Piping Mike. Texas A&M wore three jerseys this year. The two already mentioned and the 1998 throwback they wore against Kentucky at home. If I’m not mistaken, Texas A&M wore a throwback to their 80s-90s teams this season that had the “screen printing on mesh” look that Nebraska first wore a year or two ago. Once again, I’m going to choose which unis would make for the best combos for each bowl game, assuming I could set it up as I like it. Peach Bowl: Easy start here, as Michigan in navy (picture #1) is one of the classic college football looks. I suppose red for Florida would work, but I actually like their white jerseys better, and they’re really a blue team anyway. Orange-white-blue (#2) seems the best match. Belk Bowl: Looks like the makings of a fine color-vs.-color matchup. I like Virginia in navy, but not mono-navy, so #2 gets the call. Should mesh nicely with South Carolina’s garnet-garnet-black set (#2). Arizona Bowl: Phil’s right–Nevada’s color palette is quite drab. So we’d better out Arkansas State in lots of red, specifically red-red-black (#6). Nevada can counter with blue-white-blue (#2) and that’s about as good as these teams can look. Cotton Bowl: Again, we’ve got a classic look here, in Notre Dame’s gold-blue-gold set (#1). That sets up a fine color-vs.-color pairing with Clemson’s orange-orange-white set (#1). I think that would be a real pretty matchup. Orange Bowl: Well, Alabama is going to have a classic look either way, but I’d prefer to see them in red (#1). Since the teams have such similar color schemes, I’ll have Oklahoma in the whites with the colored sleeves and the red pants (#3) just for a bit of differentiation. Military Bowl: Isn’t it kind of redundant to have an Armed Forces Bowl and a Military Bowl? I know I don’t want Elvis Costello to put out an album titled Military. Anyway, this is a tough one. No one set is great, and the ones I like don’t necessarily go together well. I think I will put Virginia Tech in mono-white (#1), since they still get a fair amount of color in there, and pair it with Cincinnati in red-black-red (#2). Although if they want to switch their chrome helmets in, I wouldn’t object. Sun Bowl: Gotta get Pitt in throwbacks! Stanford is best in, well, cardinal (#1), which could actually go with either Pittsburgh throwback set. I think I’ll stick with the white version (#7)…somehow throwbacks with color-vs.-color just doesn’t feel right, at least here. Redbox Bowl: I’m definitely one of those old foggiest who doesn’t have good thoughts about Oregon’s unis and all that neon. So they get the white set (#4). Michigan State then gets green-green-white (#1). Liberty Bowl: Color-vs.-color is a reasonable option here, but I just like the way Missouri’s yellow-white-yellow combo (#5) pops, so I will face it off with Oklahoma State in white-orange-white (#8). Holiday Bowl: Well, here we are, with what is clearly the most important game on the schedule, and, really, one of the most potentially momentous events in college football history. Why, yes, I *am* a Northwestern alumni, why do you ask? Sorry, Paul, but Northwestern should be in purple as often as possible. That pretty much forces Utah into white, and I like the red-white-red (#5) the best. Did NU really not wear purple helmets all year? White-purple-white (#10), then, although an old-school purple helmet would be even better. Gator Bowl: Texas A&M looks a bit better in white (#2), though you can’t go wrong either way. Let’s put NC State in red-red-white (#1) with that. Outback Bowl: I like Mississippi State in the maroon with the grey pants (#4); that’s a nice combination. That puts Iowa State in the whites, which I think is their better look as well. Citrus Bowl: Built-in contrast here between one team which goes very minimal and one which does not. I’ll put Penn State in navy (#1) up against Kentucky in blue-white-blue (#5). Contrast, but not so much as to clash, I’d say. 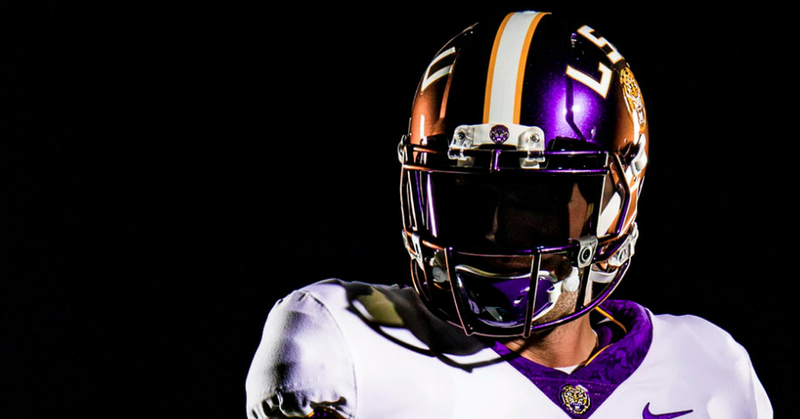 Fiesta Bowl: While I like purple, I respect that LSU keeps that to once a year, and their standard white look (#1) really should be what they wear in any bowl. You know what? I think Phil ‘s right that the space-themed uniform Central Florida wore (#7) is as good as it gets with them, so they’ll make an encore appearance even though I don’t usually want to do that special occasion sets like that. Rose Bowl: Again, when you have a truly iconic option, you go with it, and that’s The Ohio State in red (#1). Washington gets gold-white-purple, and the Granddaddy should look fine. Sugar Bowl: Nice and simple. Georgia looks good in white (#2), which is good because there’s no way I’m missing out on Texas in orange (#1). I hope people enjoyed this…if you did, please let me know so I’ll be motivated to do thus again next year. Either way, thanks for reading this far, and Happy New Year to everyone on the site. You have some good taste in uni choices Brett! Like your idea for your old school Northwestern. We will look forward to your bowl choices next year. Man, there are a lot of bowl games in U.S. college football. Maybe too many? Apologies if this comes through twice, but it doesn’t appear to have posted. I only counted two sets of white pants for NC State. The regular pair with “WOLFPACK” on the left leg and the White Ice pair with “NC STATE” and a stripe on the left leg. Both have the Tuffy (wolf head) logo on the right hip, but the promo photos showed a block S on the right hip of the White Ice set, which were not worn. The weight belt belongs to a wrestler named Cody Rhodes. He is starting a new wrestling promotion that is backed financially by the Khan family who own the Jaguars. Thus the Jaguars color and font scheme. I believe Georgia wore black in their second to last game of season. And I also believe OU wore a combo of their “Bring the wood” set that paired their red jerseys with white helmets and white pants. Overall, this is one of my favorite reads of the year and it’s almost comical how many teams now literally have a new combo for every game. As it’s getting pretty ridiculous, it’s interesting that Oregon, essentially the forefathers of doing that, are now regressing to fewer combos. The pendulum will always swing. Georgia did not wear black this year. They haven’t worn black for a couple of seasons. Nike provides a set of black jerseys every year in the hopes the Dawgs will wear them, but Kirby Smart is not a fan of them. They let recruits take pictures wearing the black jerseys when they visit, but that’s about all. I hope they never wear them. Texas A&M wore these throwbacks at home against Kentucky to celebrate the 20th anniversary of the 1998 team. Buckaroo is a different term for cowboy. With the city of Pendleton hosting the Pendleton Roundup since 1910, Buckaroos ties into the Roundup (rodeo). Pendleton hosts the annual “Let ‘er Buck” rodeo. Good times! Sometimes when I see the “Let’s go bowling” in the title, I’m a bit excited. I then quickly realize it’s not going to be vintage bowling stuff but U.S. college football. Those U.S hockey uniforms are not the best. Need some fixing. I’ll be going to see Russia vs. Switzerland in person tomorrow at Rogers Arena. Of course, will be decked out in my Canada gear. The Gene Sanny stuff is very nice. It reminds me of the artwork from Pro Magazine that they used to sell at NFL games in the 70s. At least you got MSU right. Speaking of that game, The Wife and I saw a promo for it during the Cavs/Hawks game. she wasn’t paying too much attention (I don’t blame her) so she thought they called it the Ripoff Bowl. I told her she wasn’t too far off. Clemson calls their orange pants their “championship pants” – they only wear them when a championship is on the line: when they can clinch their division, when they play South Carolina for the state championship, in the ACC Championship Game, and in the national championship game. The first time the Tigers played in the College Football Playoff Semifinal they did not wear the orange pants. Later Dabo realized they should be worn then as well. Clemson’s purple unis are their military game. Purple represents the purple heart award. The comment about the orange being their championship uniforms is correct as well.